Second part of the bestselling series! Be part of the story – An adventure awaits! 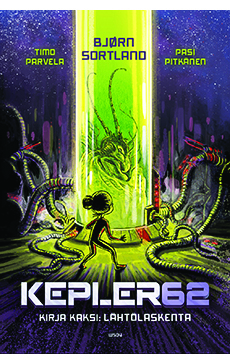 All around the world children are trying to complete all levels of the game Kepler62. In Norway, Marie, the 14-year-old daughter of a wealthy arms manufacturer, uses some unorthodox methods to beat the odds and win. But to win what? She is flown to Area 51 in Nevada to join a very select group of children who are in training for space travel and more. The group is preparing to leave the Earth for a quest to settle on a faraway planet Kepler62e which should, or rather might, be capable of supporting life. Area 51 lives up to its reputation: Marie discovers a Whisperer, an imprisoned alien. The Whisperer warns her about going on the space voyage. But Marie shall find that dropping out is not a viable option.